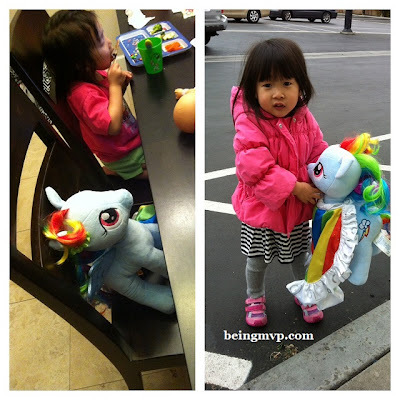 being MVP: Build-A-Bear Workshop: Rainbow Dash & Giveaway! Build-A-Bear Workshop: Rainbow Dash & Giveaway! One of my first dates with Hubs was at a Build-A-Bear Workshop store. We went with another couple and made some friends. I made a monkey and outfitted him to the nines in preppy style. It was so much fun and I still have him to this day for Kenzie to play with. I was excited to receive the new My Little Pony Rainbow Dash plush for Kenzie because I grew up with My Little Pony and wanted her to enjoy this iconic character. She arrived with the signature box "house" that is great for gifting. Rainbow Dash has a multi-colored mane that can be brushed, combed and braided. Kenzie was so excited to play with her My Little Pony especially because she has on the signature cape. Kenzie has a fascination with capes at the moment. The multi-colored mane can be combed and styled with an exclusive My Little Pony hairbrush. I need to go buy this for her asap - good thing there is a Build-A-Bear Workshop store across the street from my work. Right off the bat, Kenzie wanted to put Rainbow Dash in her house and tote her around. She then wanted Rainbow Dash to join her at dinner, kicking me out of my seat. After dinner and play time, Rainbow Dash found a place in Kenzie's bed and was tucked in properly for a good night's sleep. In the morning, Kenzie had to take Rainbow Dash to school for fun learning. I've never seen Kenzie so attached to a stuffed animal before but am happy that she has found a friend. Build-A-Bear Workshop is so much fun whether you go into the store with your child to make a stuffed friend from the shell to picking out fashions or perusing the website to choose your already made friend and picking out fashions. You can even throw your child a Build-A-Bear party - how much fun is this? Buy It: You can purchase Rainbow Dash for $24 and the signature cape for $13.50. Make sure to connect with Build-A-Bear Workshop on Facebook and Twitter! One Winner will Receive a $25 Bear Bucks Gift Card! My daughter is obsessed with Hello Kitty and would love the pink one. We would probably get the Rainbow Dash! My daughter wants the sunshine hello kitty. I'd love Rainbow Dash or Pinkie Pie! SO adorable!!! I'd like the Flower Fun Bunny. My daughter would love a bear in the Snow White costume! Each of my girls has a special bear from them so I would get them more outfits. My on would love the sea lion. I think we would have to get Pinkie Pie or Rainbow Dash, my son loves my little ponies! I like the Autism Speaks bear. I love the sweet in sequins pinkie pie! Rainbow Dash is a favorite at our house! I would probably get the Rainbow Dash! i would have to get rainbow dash!! i love her! i would totally get the cape too. so awesome! Ilike the Sunshine Hello Kity. My daughter would love Pinky Pie! I love the 14 in. Peanut Butter Cub! Oh snap!! I had no idea they had MLP now! I would definitely get my daughter the Pinkie Pie one, she's obsessed! Id get a Paddington Bear!! Best Friend Furever Hearts Bear. I would get the 18" Hello Kitty Sunshine! Pinkie Pie! My daughter loves My Little Pony!! My daughter would love 16 in. PINKIE PIE! Thanks for the chance to win! My daughter wants the Rapunzel outfit and wig to go on her bear. My daughter would love the Sunshine Hello Kitty. Thanks so much for the fantastic giveaway! I am pretty sure that my son would choose the giraffe, he loves them! for sure mu lil pony! I would get the pinkie pie pony. My grandson would really like the autism speaks bear. The 16 in. Rainbow Hugs Bear is cute. We would get another Bearemy that laughs so I can clean the one my son is attached to. i'd get her pinkie pie! I would get Erik from Happy Feet for my kiddos. My son would pick the elephant if it's available at the store! Rainbow Dash, all the way! I'd get the Calico Cat. I would buy My Little Pony Rainbow Dash BAB for my daughter. My grandson would love the giraffe or the Paddington Bear, thanks! the All Smiles Autism Speaks® Bear is cute! I would get the build-a-bear smallfrys Pink Flower Hello Kitty. I would get the 16 inch Rainbow Dash pony! It's adorable!! MY daughter wants a Rainbow Dash pony. Love the Minnie Mouse inspired bear! I'd get a Disney bear. I would get Girl Scouts Thin Mints® Bear in Brownie Uniform! my kids would love the monkey! I'd get a Hello Kitty for my daughter. I would get the 16 inch Midnight Teddy bear. My son wants the iron man costume. My daughter would like the hello kitty. I would get the 16 inch Rainbow Pony. my daughter couldn't decide...first it was a bear, then it was hello kitty, then it was the pony, then it was a black lab.....hehe she just doesn't know! My daughter would probably pick 18 in. Sunshine Hello Kitty! The second she sees that MLP, I know she's going to choose her - but I'll hold out hope that maybe she'd choose the Cheerful Sunshine Hello Kitty instead. I love how excited your little girl is about rainbow dash. I love build a bear...it is almost as exciting for me when I take my little one in! Flying Colors Rainbow Dash! I also didn't know that they were carrying Autism Speaks bears. How wonderful! I would like the Girl Scouts Thin Mints Bear. The 16 in. PINKIE PIE®! So Cute! 16 in flower fun bunny! I like the Fairy Princess Happy Hugs Teddy. Thank you! I think she'd want Pinkie Pie the most. I'd ger either the 16 in panda or the mini snow leopard(im obsessed with mini)! I would get the Cheerful Sunshine Hello Kitty. their married life together for the rest of their lives. The latest celebrity fashion brings dogs which are a high fashion commodity being traded in of recent.